B&B in Cagliari is a young association of more than 100 B&B's in Cagliari. You find all offered B&B's at www.bbincagliari.com. The website is new and at the moment only in Italian language available. Just select the B&B of your interest on the map or via the menu Strutture associate. You find information on the B&B with direct link to the B&B-website, almost always in English language available. You book directly in the B&B of your choice. Cagliari charming accommodations is a second association that presents several B&B's. At their website www.cagliariaccommodations.com, scroll down and choose the Accommodation-menu. You get photos of B&B directors. The 'Booking now' button brings you to their websites. Below you find a list with other B&B's and the room rates they offer. Feel free to consult their websites for all details and to contact them in case of interest. Room rates are breakfast included rates. Some B&B's have lower rates for shared bathroom or without breakfast. The distances mentioned, are the approximate distances to the Manifattura Tabbachi. *La Villa del Mare: free cancellation up to 7 days before arrival, 80% not refundable 7-2 days before arrival, 100% payment 2 days before arrival. 8% discount for not refundable booking. *Cagliari novecento: private toilet, wi-fi, airco, Italian breakfast in nearby café. 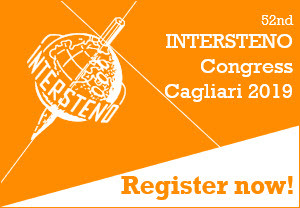 Mention INTERSTENO CONGRESS 2019 in contact by e-mail. *B&B La Terrazza sul Porto: 1 room with outdoor bathroom, 600.00 €/day all for max 18 people + 50.00 € final cleaning (valid until 31st December), washing machine 12kg, kitchen, airco. Breakfast included.